Weather: Warm and sunny today – Welcome to Wyandotte Daily! Today’s weather will be sunny with a high near 86, and a south wind of 3 to 6 mph, according to the National Weather Service. 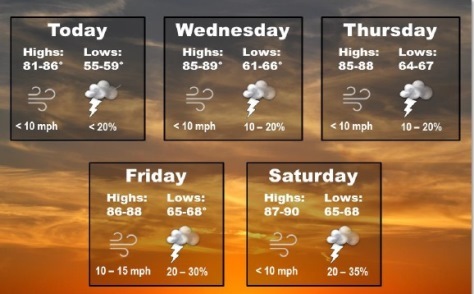 Temperatures will continue in the high 80s or low 90s for the rest of the week, the weather service said. While rain is possible for the coming weekend, the weather pattern mostly will be dry conditions and very warm temperatures. Tonight, the low will be near 66 with a south southeast wind of 5 to 9 mph becoming light after midnight, according to the weather service. Wednesday’s high will be near 88 with mostly sunny skies and a south southeast wind of 5 to 9 mph, the weather service said. Wednesday night, the low will be around 68 with partly cloudy skies and a south southeast wind of 6 to 8 mph, according to the weather service. Thursday, there is a 20 percent chance of showers and thunderstorms after 1 p.m., with a high near 88, the weather service said. There will be a south wind of 5 to 10 mph. Thursday night, the low will be around 68 with partly cloudy skies, according to the weather service. Friday, the high will be near 87 with partly sunny skies, the weather service said. Friday night, expect a low of 69 with partly cloudy skies, according to the weather service. Saturday, there will be a 30 percent chance of showers and thunderstorms after 1 p.m., with a high near 89, the weather service said. Saturday night, the low will be around 69 with partly cloudy skies, according to the weather service. Sunday, the high will be near 90 with sunny skies, the weather service said. Sunday night, the low will be around 68 with partly cloudy skies, according to the weather service. For Monday, Memorial Day, the forecast will be mostly sunny with a high near 89, the weather service said.